A new milestone. My Blacklisting is featured on Voices-Voix. In Spring 2011, when I discovered I was being blacklisted, I researched who else had been bullied and silenced by the Harper Government. Once I started “Googling” I found lots of people who had been attacked for disagreeing with the government. The Voices-Voix site was one of my key resources for making the Black Swan flag below — featured in my visual essay Banned on the Hill. Visit Voices-Voix to read about attacks on individuals, organizations and knowledge. Below is the Voices-Voix summary of my blacklisting reproduced from their site. Role or Position: Franke (pronounced “Frankie”) James is an artist who makes visual essays about social and environmental issues, especially art relating to climate change. Franke James had been asked to do a European tour of her artwork, which advocates a healthy, clean environment. The Canadian Embassy initially gave the organizers of the show $5,000 for the project, but withdrew the funding a month later, and refused to support Franke James in any other way. James alleges that the government also attempted to prevent private sponsors from assisting her tour, and covered up its motives for intervening – motives based on silencing advocacy for the environment. Nektarina Non Profit, an organization trying to educate people on living sustainable lifestyles, was planning a 2011-2012 tour of Franke James’ artwork to 20 European cities. The goal was to inspire youth to become more eco-friendly. One month later, on May 25th, 2011, the Canadian Ambassador in Croatia wrote to Nektarina, explaining that the funding promised for the art show was now unavailable due to budget cuts. On August 16, 2011 Franke James requested all government documents regarding her European art show through Access to Information (ATI). Since the ATI documents were released the government has been very tight lipped on the matter. However Conservative political activist Tom Flanagan participated in a discussion with James on national radio. Flanagan maintained that the government can indeed be selective about what art it chooses to support, and that James’ work is more “activism” than art. James says that she has been treated unjustly, and that the real problem isn’t the funding for her show, but the government’s behind-the-scenes interference to dissuade the show producer (Nektarina Non Profit), and other supporters from showing James’ artwork. James is shocked by the government’s actions, considering she has never advocated civil disobedience. “I believe we should change the laws, not break them,” said James. Newly released Access to Information documents reveal that on July 12 2011, the Canadian Ambassador to the Baltic States, Scott Heatherington, stated in a letter to Canadian Embassy colleagues that he did not feel comfortable supporting James’ artwork. He then directed them to her visual essay “Fat Cat Canada” as an example of why support should not be granted. This makes it clear that the content of James’ work was a factor in why support for her show was refused. In December 2011, Canada’s Green Party formally asked the Conservative government about the incident: “With regard to the Right to Freedom of Speech enshrined in the Canadian Charter of Rights and Freedoms, on what legal basis did DFAIT ground its decision to withdraw support and revoke Ms. James’ allotted funding?” According to Parliamentary procedures, the government has 45 days to respond. Planning, Advocacy & Information (GLB) writes a letter to the Canadian embassy in Croatia giving approval of the Franke James tour and saying they were able to give $5000 toward the project. Jeremy Wallace, Deputy Director of Climate Change at DFAIT, recommends withdrawal of funding for the show. Deborah Price, the counselor at Canada’s Romanian embassy, expresses her wish that the MDC should morally support James’ exhibit and allow Canada’s word mark to be associated with the event. Wallace quickly responds, saying that they are “against Cdn support/endorsement in this case”. The Canadian Ambassador in Croatia writes a letter to Nektarina Non Profit stating that the money allocated to the project was unavailable due to unexpected budget cuts and they could no longer support the exhibit. July 8, 2011: James contacts embassies asking to rent space for a press event. In her letter she names a private sponsor that Nektarina Non Profit had found to help with the project. The private sponsor tells Nektarina Non Profit that they are pulling their funding for James’ art show because they have been contacted directly by a Canadian official and feared damage to their company if they remain involved. The Canadian Ambassador to the Baltic States, Scott Heatherington, states in a letter to Canadian Embassy colleagues that he did not feel comfortable supporting James’ artwork. He then directed them to her visual essay, Fat Cat Canada as an example of why. Nektarina publishes an official statement that they have been “intimidated” by the Canadian Government. Franke James requests Access to Information (ATI) documents regarding her and her European tour. ATI documents are released to James. They prove that the reason she will not get funding is not due to budget cuts, as the Embassy had told Nektarina Non Profit. Franke James holds an art show called Banned on the Hill, displaying her artwork on the streets of Ottawa. The Green Party of Canada formally questions the Conservative government about intervention with Franke James’ European Tour. Free Speech: The government’s withdrawal of promised funds based on the message in Franke James’ work, and its intimidation of a private sponsor, amounts to a form of censorship and an overt attempt to silence an independent critic of the Harper government’s environmental policy. Transparency: The Harper government’s cover-up of its motives for not funding James’ art exhibit constitutes a failure of the government’s responsibility to be transparent. 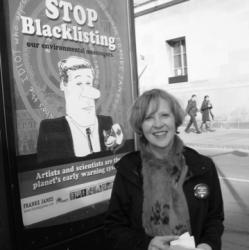 “Artist sees red over government ‘blacklisting,’” Tonda MacCharles, The Star, July 28, 2011. “Canada’s Climate Change office secretly killed approval for Franke James’ European tour: govt documents reveal,” Franke James, November 2011. 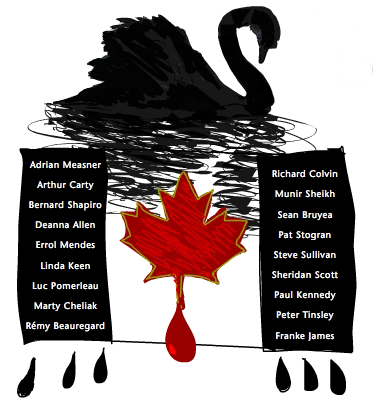 “Government officials killed funding for Canadian artist: documents,” Amy Chung, Postmedia News, November 2 2011. “Writers’ groups concerned by defunding of Canadian artist,” Canada Newswire, November 24 2011. “The intersection of govt, art and politics,” The Current, CBC Radio, November 16 2011. “Franke James Update,” Heather Nicholas, New Society Publishers, December 13 2011. Publications December 13 2011, Parliament of Canada, Question #380. “Canada’s Approach to Inconvenient Art,” Andrew C. Revkin, New York Times, December 16 2011. “Tim Harper: Three women who fought back against the Conservatives,” Tim Harper, The Star, December 18 2011. “A Canadian artist takes on the Harper government,” Andy Radia, Yahoo Canada Politics, December 20 2011. More information on Franke James Blacklisting. Similarly to New Zealand, which has a worldwide reputation for being green, but of course has just as much muck under the rug. Congratulations to you Franke for exploring the world of opinion that counters the running commentary we hear from the mainstream.